﻿ Wide Span Racking | E System Sales, Inc. When bulk or weight eliminates the use of storage shelving, Madix Wide Span Racking is the ideal alternative. It is affordable, has many commercial, and industrial applications. Frames are slotted on 2" centers to accept brackets on horizontal beams. Beams are tied together by steel deck supports. 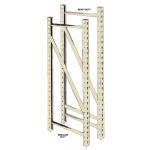 Wide Span Racking is a great choice as a display for heavy bagged goods, products, machinery, and tools. Wide Span Racking can also be used for the storage of heavy bagged goods, products, machinery, and tools. Wide Span Racking basically is constructed of Upright Frames, Beams, Deck Supports, and Decks that assembles fast easily. We also have available affordable Beam Kits for basic configurations. For advanced applications like refrigeration and outdoor use beams can be configured. Heavy gauge 13/4" square Upright members with welded oval cross braces are slotted 2" OC for adjustability. Heavy-Duty Frame has additional bracing to resist accidental stacker impact. Top beam will fit flush to top of frame. Requires a minimum of two decks, four beams, per section. Wide Span Decks available is a Wood Deck, a Wood Sealed Deck, Wire Deck Styles, and a Steel Deck. Wood Decks are durable 5⁄8" particle board and are available in a Regular and Heavy Duty configuration. Sealed decks have baked-on polymer wax finish. Heavy gauge beam body with integral connectors fits snugly into upright slots and maintains deck align­ment with basic fixture slotting. One beam pair required per deck. Image shows two Wide Span Beams and three Wide Span Deck Supports. Standard finishes: Sahara or Blue Gray. Wide Span Deck kits include beams, supports and decks. 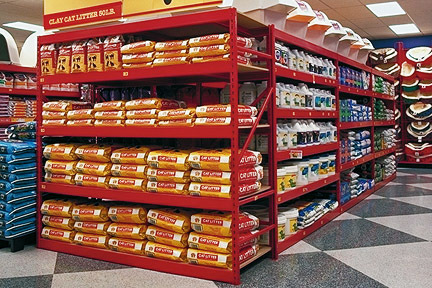 Compatible with the more basic applications mostly used indoors for large bagged goods like Dog Food and Cement. 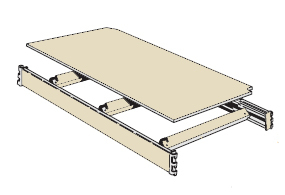 Wide Span Deck kits available with a wood deck and a wire deck.